Today, we know that introducing a foreign species into a habitat, no matter how benign it seems to be, is a really bad idea. The Bradford pear is one prime example of this. The small and decorative tree was a staple of the thousands of new subdivisions that sprung up across the country between the 1956s and 1990s. It was also planted in urban parks and flanking new streets and boulevards. Because it was hardy and durable, and it had a sought-after size, shape, and appearance, the Bradford pear tree was to go-to tree that helped to make suburbia look like a cookie-cutter world. The Bradford pear seemed like the perfect addition to the perfect neighborhoods that were being built. There was one problem, though. The Bradford pear was an invasive and aggressive species. The Bradford pear is a hybrid variety of the Callery pear, which is native to parts of Asia, including China, Korea, and Japan. It was first brought to the United States in the early 1900s to be used in pear orchards. But several of the tree’s traits caught the attention of botanists. Among these notable traits was the tree’s ability to resist blight. The United States Department of Agriculture’s scientists, chiefly Frederick Charles Bradford, believed that the tree could be developed as an ornamental tree for landscaping. The result of their efforts was the Bradford pear tree, which was marketed to housing developers, landscapers, and urban foresters beginning in 1963. Homeowners loved the Bradford pear. It didn’t grow to over-power the yard, it had beautifully glossy leaves, and maintained a balanced silhouette without trimming and pruning. In the early spring, the tree was among the first to welcome spring when it put out its full, white flowers. When autumn hit, the tree’s leaves turned the colors it was supposed to for the season…orange and deep red. The tree was low-maintenance and wasn’t not susceptible to diseases and insect pests. More importantly, it was a ‘clean’ fruit tree, unlike the crab apple and the mulberry that would drop their fruit all over the yard. As a hybrid, the Bradford pear was sterile so it couldn’t propagate itself. But the tree was grafted on the root stock of other pear trees, so it merged with the DNA of the root stock, therefore, it could, if it was near enough to other Callery pear varieties, cross pollinate with other trees to produce fertile seeds. The fruit attracted birds and animals that helped to scatter the seeds even further. The problem was, however, that the trees that grew wild from these seeds did not carry on the positive qualities of the Bradford pear. The feral trees were unruly, thorny, and fast-growing. Left unchecked, they soon formed clumps of impenetrable thickets that choked out the native plant life. 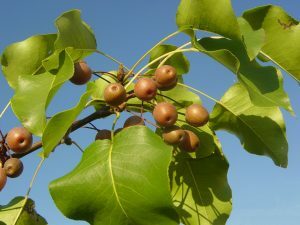 By the start of the 2000s, it was becoming clear that the Bradford pear was the cause of the glut of invasive, rogue pear trees across more than half of the country. Because the tree is not native to this country, it had no natural enemies. Plus it was genetically bred for its ability to resist disease and blight. The seeds, dropped by birds, bats, or other animals, easily took hold on, especially on newly-disturbed soil. This made the offspring of the tree so hardy that it took over its new environment and pushed out the natural vegetation. The invasion of Callery pears is more pronounced in the Southern states, such as Mississippi and Alabama. The Department of Natural Resources has used an army of volunteers to go into state and national parks, public areas, and along streets and highways in an effort to remove the renegade offspring of the Bradford pear. It is no easy task. If the trees are simply chopped down, a new tree can sprout from the root. That means, to completely eliminate the plant, the volunteers have to remove the entire root system of each and every tree. It is back-breaking work, but the job isn’t finished when the tree is gone. The area then needs to be restored to its natural habitat, therefore the workers have to plant native species. It is especially important that they use ground cover because new Callery pear seeds can settle in the disturbed soil and take root, undoing all their hard work. Experts strongly suggest that all non-native ornamental plants be removed from household landscaping and replaced with native varieties. 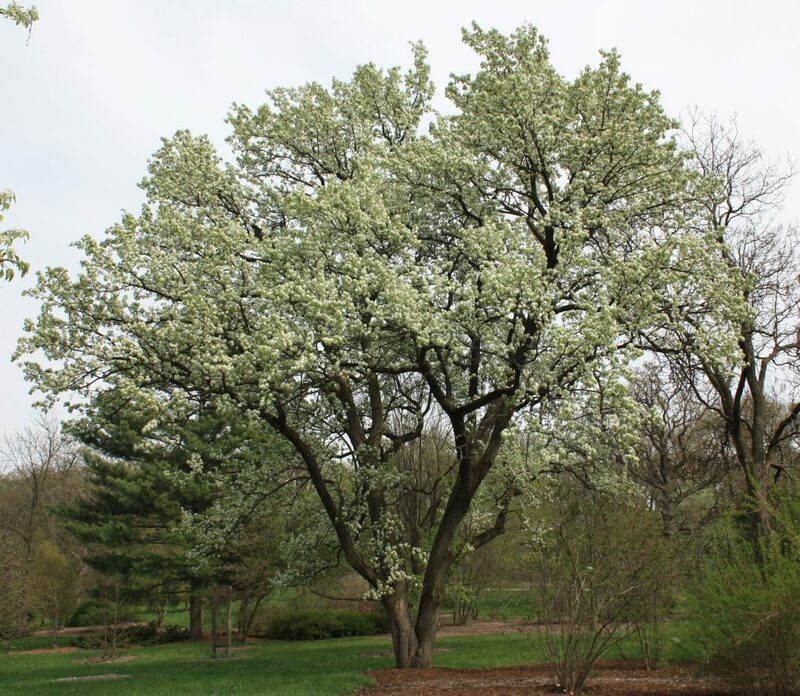 Just as we have found with the Bradford pear, even the most innocent introduction of foreign plant species to an area can have severe and long-term ramifications. Frederick Charles Bradford and the other botanists who developed the Bradford pear could not possibly have predicted the environmental disaster that the compact, symmetrical flowering ornamental tree created when they advocated for the tree to become one of the most popular trees for urban foresters. The Bradford pear serves as an important lesson in the snowball effect of toying with non-native species. Ashmore, Durant. “The Curse of the Bradford Pear.” The Greenville News, 3 Mar 2017. Web. 30 Oct 2018. Higgins, Adrian. “Scientists Thought They Had Created the Perfect Tree, But It Became a Nightmare.” The Washington Post, 17 Sept 2018. Web. 30 Oct 2018. Skalicky, Michele. 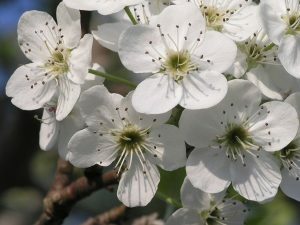 “Bradford Pear Trees: An Invasive Species.” KSMU Radio, 2 May 2018. Web. 30 Oct 2018.